Kia aims to break into the top five | What Car? Kia says it has almost completed the job of reinventing its line-up and image to attract new buyers and realise its goal of becoming one of the worlds top five largest manufacturers. At the moment, said the companys marketing and product planning boss Benny Oeyen, there are two Kias. One is represented by the wave of new models such as the Sportage and the Optima, while the Picanto, Rio, Carens and Sedona show the old face of Kia, he said and they are the models that are due for replacement. Oeyen wouldnt give dates for when this old guard might disappear, but from the usual life-cycle of models, its easy to see that the Picanto city car and Rio supermini are ripe for replacement next year. New versions of the Carens and Sedona MPVs are also sure to be on the way soon, and once theyve arrived, will complete the transformation of the brand. Everyone in the company hopes the new cars will bring more sales, of course, but the key according to Kia is in changing buyers perceptions, so that they think Kia offers value-for-money products, not cheap ones. Kias boss, S Y Kim, told the Paris show: We look forward to winning the hearts and minds of buyers over the coming years. The company has ambitious plans to break into the top five of the biggest-selling brands, both in the UK and the rest of the world, and, so far in 2010, it has made dramatic progress. Global sales increased by 32% while in Europe they have risen 10% against an overall market fall of 10%. 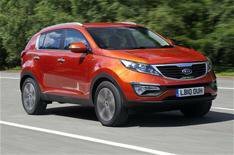 In the UK, Kia wants to grow from last years sales of 55,000 to more than 100,000.